The wonders of the ocean are a great source of inspiration; let Ocean Dream by Designer Parfums take you on a journey of discovery. Using modern perfume technology, Ocean Dream captures the olfactory spirit of the ocean and emotion it conveys, combined with beautiful waterflower notes. The Ocean Dream experience comes alive through the collection of unique bottles. Inspired by the romantic folklore of weathered-looking bottles washed ashore, the timeless wonder of the ocean is expressed through iridescent sea-glass. The home of the Ocean Dream fragrances by Designer Parfums of London. The original Ocean Dream was created in 1996 by Giorgio Beverly Hills to capture the essence of the ocean coupled with the cool attitude of a California life style. 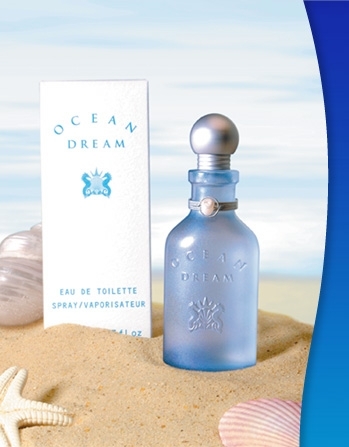 Acquired by Designer Parfums in 2003, the Ocean Dream brand has continued to grow. Since then a men's fragrance and a new ladies' scent 'Ocean Dream Coral' (2006) have been launched. All images, logos and info on this site are protected by copyright. All trademarks used on this site are acknowledged.